Fabulous Metal Christmas Decorations, Saturday 17th November 2018. 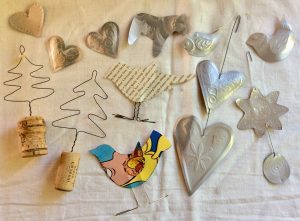 Enjoy a day of festive bonhomie at The Slipper Studio and create a range of handcrafted metal and wire decorations to enhance your home at Christmas. Saturday 17th November, 10 – 4pm, £65, including materials and refreshments; please bring your lunch. For further details and bookings email me: enquiries@lizwellby.co.uk.